What makes a good leader? Leaders are people who have to make impossible choices on a daily basis. What kind of person and leader do you end up becoming after making an impossible choice, though? 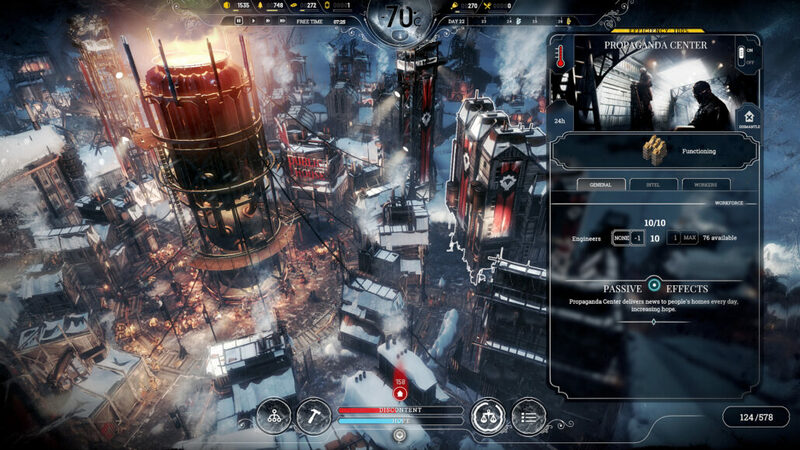 That’s the question the team at 11 bit studios poses to the player in what they call the first society survival game, Frostpunk, a natural evolution of the themes already seen in This War of Mine. At its core, Frostpunk is a city management sim that takes place in a frozen wasteland and you’re tasked with ensuring the last bit of the human population survives these terrible conditions and prevent the extinction of the species. The people you’re managing are the inhabitants of London and they need a home. New London is going to be humanity’s attempt at a second chance. Your city is built around a massive Steam Generator which provides heat to all the nearby areas. Early on, this is where most of the population will settle before sending them out to resource gather. The bulk of your game is building around this Generator to ensure that all buildings are provided some sort of heating for them to be operational. More so, heat makes sure your people don’t die of sheer exposure. You can unlock steam cores, that will provide heat in areas further out from your Generator since expanding your Generator is possible but a more time/resource consuming. You’re constantly keeping an eye on all your resources like wood (for heating) and steel (building structures) and food (hunger) trying to keep them at levels that you can handle. The hope and discontent meters tell you how ‘happy’ you’re people are. As you progress now the tech you’ll build material depots and other means of mining resources that’ll make you’ll live a little easier as you shift workers around into more productive roles. No one is really ‘happy’ being the last generation of a near-extinct human race but you catch my drift. Too much discontent and discomfort from the lack of basic human needs like shelter, heat, and food could result in the population getting sick and unable to work, with dead frozen bodies piling left and right. A hope-filled populace will work harder, be more healthy overall and simply produce more for you. The plate spinning is what people expect in these sort of simulation games. You will constantly adjust the number of works you from working the coal mines to fuel your Generator, to hunt when food stores run low, or work in the medical tent when you nearly work everyone to death. Depending on the scenario, you’ll need to abruptly change your plans day by especially if you want to accomplish individual demands from your people. One thing you need to make sure is that you always have coal to run your generators at night so that no one freezes to death. The fact that people work during the day and not at night forces you to think ahead. Stockpiling enough resources to survive the night becomes a necessary exercise. You can force your workers to work 24-hour shifts, but then again, that will raise discontent. Raise it too high and your people will force you into exile for making their lives miserable. The mental gymnastics you’ll do to negotiate how much hope/discontent is acceptable is a constant battle that’s dictated by exactly what your city needs at that moment. It’s fun to put a plan in motion and hit fast-forward and see what happens. It’s one thing to manage city of faceless people going about their business but the fact that each person under your care has a name, family, and life goals adds a layer of humanity that make certain decisions put a lump in your throat, like forcing them to work in unsafe working conditions or shutting off their heat to keep your Steam Generator from blowing up and killing everyone. You end up feeling bad and trying to rationalize each decision you make with the phrase, “I’ll make it better for them in the long run.” So yeah, I did start a child labor force and not everyone was thrilled about it. Still, my production went up with my new pool of workers. To balance out the discontent, I made sure the next law I passed would be something that made them happy, like setting up a fighting arena. People seemed to be ok with a child-based workforce so long as they got their Fight Club on. Chances are they won’t be too thrilled when I decide to put their dead into snow pits so we can harvest organs for transplants later. Don’t make that face, at the end of the day you’re rebuilding a society not just a city and people need organs, damnit. It’s hard to take the moral high ground when choices like that come up. Frostpunk is also one of the better looking city-builder games I’ve seen in a good long while. It looks impressive when zooming in as much as possible and seeing these poor souls dig their way of snow to head to the numerous resource sites on the map. Whenever you drop a new steam core, you instantly see the snow melt around its area of effect and that will make you feel good for providing heat for the desperate folks in that area. The way the city spirals out when it expands rather looking a typical grid is striking. I really loved unlocking the giant robotic spiders who essentially replace the workers at a production plant, too. Watching them clamber onto the building never gets old. When your city comes to life during the day, often you can see what a daunting operation you’re running. I loved seeing the whole thing shut down at night when all your workers head home to their little shanty towns. 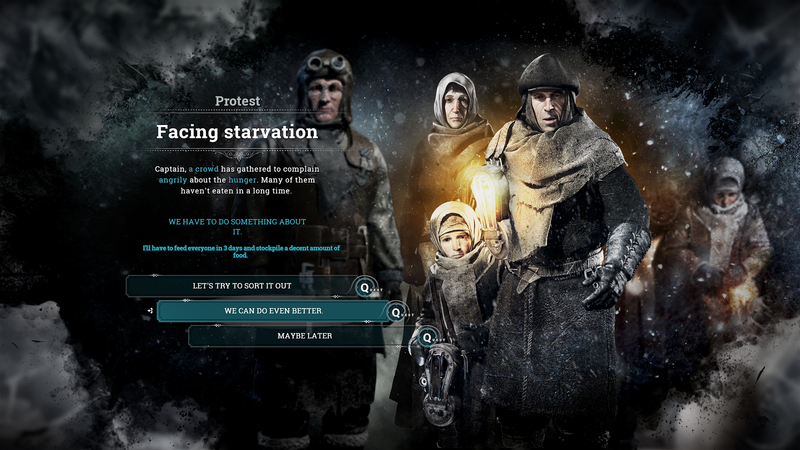 There are many subtle ways Frostpunk tries to show that these are people rather than autonomous drones sent to gather resources; this works especially when random missions from them pop up asking for more medical outposts or to find their lost family member in an Expedition. 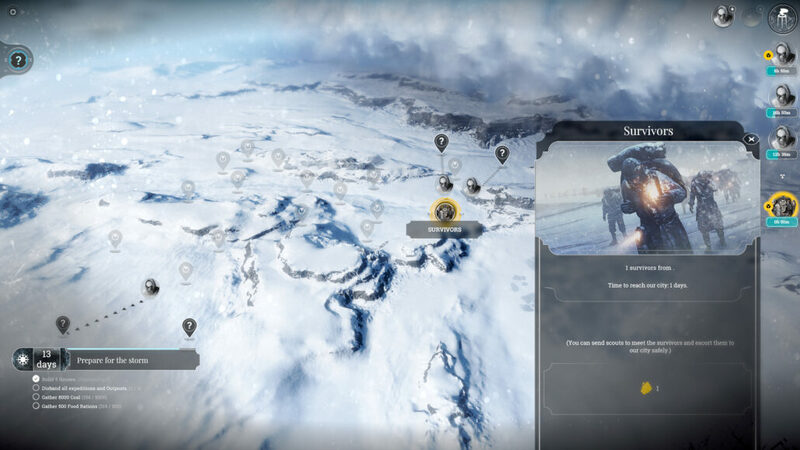 Expeditions allow you to send small scouting parties out into the world to look for more survivors, resources and signs of life outside of your city limits. These missions are a good way to drum up hope if you’re playing a ruthless leader and it also gives you more information about the world at large. That being said, Frostpunk is about managing systems and making sure all the cogs in your machine are working as efficiently as possible. The game ultimately wants to show that being inhumane is sometimes the most humane thing you have to do in order to survive. Each day, you’re figuring out how to make things easier for your workers like building roads and somehow you’re also making it harder for people (oops, forgot to build enough tents and now some are sleeping in the cold) at the same time. 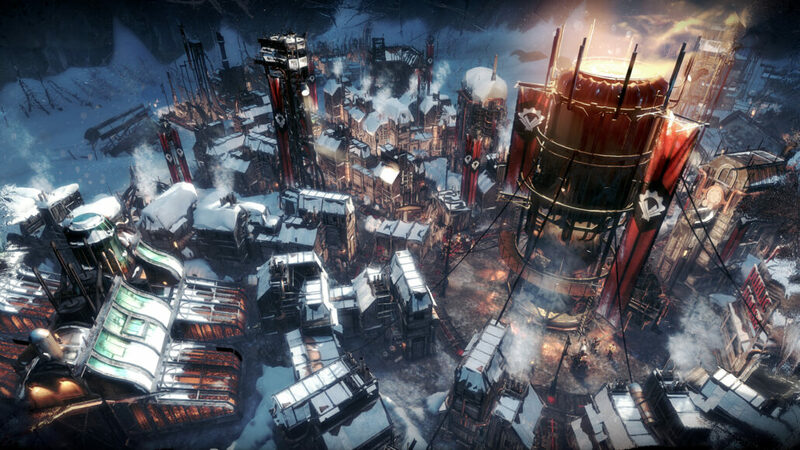 You’re constantly thinking of the bigger picture in Frostpunk. Do you let 50 people die off suddenly so that you can prevent your entire population from starving or do you divert resources and try to make it work? My first couple playthroughs, I tried really hard to focus on making everyone happy instead of the utilitarian approach and it eventually blew up in my face. The user interface is easy enough to navigate and never seemed to make me dig too long into menus. I will say, placing new buildings can feel a bit unwieldy. On more than one occasion I had to dismantle a structure because it was exactly where I needed. Making a bad call on Day 5 doesn’t have as devastating repercussions as making the wrong call on Day 20. It’s what I loved the most about Frostpunk, you second-guess every call you make. You think that heating workplaces would make everyone happy but the cost of coal, in the end, would be devastating to your economy. Frostpunk is unforgiving and punishing but that’s why you’ll invest more and more time into it. It takes what you know about city builders and turns it on heads. It’s bleak, and the beautiful design brings life to an otherwise frozen hellscape. The race against the clock is stressful as you try to make sure everyone is alive while the weather gets colder and colder and materials become more and more scarce. Frostpunk is a pleasant surprise that is definitely worth your time if you’re looking for something different and brutally challenging. Review code provided by the publisher. You can purchase the game via Fanatical. Frostpunk is a challenging city builder where your decisions have dramatic repercussions on the citizens you’re tasked with looking after in a wintery apocalypse. It's a pleasant surprise that is definitely worth your time if you’re looking for something different and brutally challenging.